The Cruise Contact delivers an amazingly comfortable ride thanks to its high-quality construction and ample volume. This 26 inch version is a great option for commuter mountain bikes, delivering plenty of air volume for a well cushioned ride. The dynamic tread designed also helps smooth out the rough roads. A SafetySystem puncture breaker beneath the tread and tough DuraSkin sidewalls ward off the flats. The Cruise Contact features a three ply casing for a total of 180 TPI. Available in 26 x 2.0 Inch (50-559 ISO). 58 max. PSI. Wire bead. Claimed weight: 750 grams. Black/Reflective. I was looking for tires to put on my old beach cruiser. I wanted something that road smoother than my 26x1.90 cheap slicks, had reasonable rolling resistance, and wouldnt get a flat. They do not roll as fast (maybe 90%) as the slicks but the road feel was worth it. No more pebble feed back from the road. I even noticed my brake working better with more traction. Great ride and still eats up the pavement. The reflective strip is bright at night. Im not sure how long the tread will last. I have put maybe 300 miles on them and I can see signs of wear. Great tire with very little resistance. Generally use for the road.I like everything about the tires. This is a great tire, and I have never had a flat! The (nominal) 50-559 Cruise Contact measures 48mm on a Mavic x517 rim, and works well both on- and off-pavement. For impressions of the Cruise Contact on rear combined with the Winter II in front, see my review of the Continental Top Contact Winter II 26 Inch Tire. One less star for the Cruise Overall Rating because the rubber on the sidewall has begun to develop a few very small cracks. Based on past experience with Conti tires, that's probably nothing to worry about, just a bit of a surprise given the relatively short time elapsed. But then again, it is SoCal, home to blazing sun and ground-level ozone, and the Cruise is not made in Germany. GREAT TIRE AT A GREAT PRICE. BIKE TIRES DIRECT IS THE PLACE TO SHOP. Tires were easy to install and offer a smooth comfortable ride with little noise on paved surfaces. These are great tires! Easy to mount and great puncture protection. Tires are well designed - roll smoothly and fast, yet absorbs road bumps well. Overall excellent tire I plan to use on my touring bike and commuting bike. Smooth ride and great traction. I like everything about these tires.Bought a new mountain bike that came with very rough tires.I trail ride mainly on paved trails and these tires have made my daily 10 mile ride very pleasurable .They were very easy to install without any tools.I was able to put them on the rims with my fingers.I put the max air pressure in them and they are quiet even at speed.Very very happy. 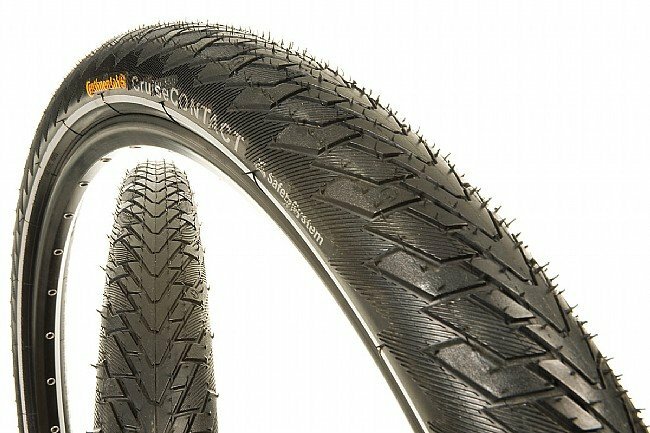 How to pick the best tires for riding your mountain bike on the road.